Product details: Unlike other stretch marks products, this is not a fancy cream or lotion. Our stretch marks product is an ancient Ayurveda method of natural remedy, removal, treatment, prevention and cure for stretch marks particularly those stretch marks caused by pregnancy and weight loss. It is a 100% natural herbal blend of rare, expensive medicinal plants and essential oils specifically meant for the removal prevention and treatment of stretch marks. There are absolutely no chemicals or preservatives. The product is in the form of a powder and has to be mixed with aloe vera gel or cucumber gel to prepare a paste before application. Product comes with gel. Results and Effects: Extremely effective in the removal, treatment, remedy and cure of stretch marks and other pale areas on skin, especially those caused by weight loss and pregnancy. 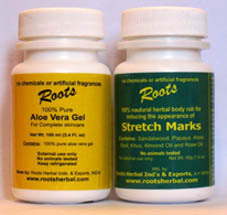 Works on all kinds of stretch marks including red, white, or pink stretch marks. Equally effective on old stretch marks. Works on all kinds of skins regardless of race or color. The only thing that determines how quickly it works is how well the skin responds to herbs. Response varies with individual's skin metabolism and texture. It also helps treating body itching and skin irritation. Additionally, it's a miracle smoothener, natural moisturizer, and skin softener. The presence of Sandalwood and Rose Oil keeps the skin naturally fragrant all day. Preparation and usage: Prepare enough paste as and when needed by mixing equal parts of powder, gel and water. Adjust water for consistency. Clean the stretch marks area with warm water. Apply a thin layer and massage until the paste dries out. Another layer may be massaged for severe cases. Leave the paste on for 30-45 minutes and rinse with warm water. DO NOT wash with soap for at least an hour. Excessive paste may be refrigerated preferably in an air-tight container. May be used daily or at least 3 times a week. Treatment duration: On an average most customers use this product for 2-3 months. You could expect to start seeing results in the first 2-3 weeks.